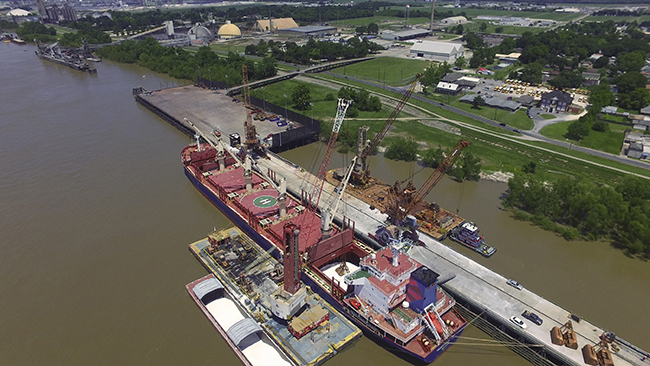 The Board of Commissioners of the Port of South Louisiana (POSL) requests funding in the amount of $15,235,000 from the 2018 Better Utilizing Investments to Leverage Development (BUILD) Discretionary Grants Program for the Globalplex Multi-Modal Connections Project (Project). The requested BUILD funding represents a critical source of funding for this project. The POSL is a deep-water port situated in the immediate vicinity of the Gulf of Mexico, near major roadways and three railways. It is the largest tonnage port district in the United States, and it is the premier sea gateway for U.S. export and import traffic. Located within the POSL is the intermodal facility Globalplex, a modern, 335-acre maritime industrial park that currently includes multimodal connections to the Canadian National (CN) Railway, local roads and state and interstate highways, local and international airports, and the Mississippi River, all providing various methods of cargo transport. The facility has three docks, which include a general cargo dock, a finger pier, and a deep-draft bulk terminal dedicated to handling cement, mineral ores, woodchips, garnet sand, and other heavy materials. Globalplex is the only public facility within the jurisdiction of the POSL. The proposed Project consists of the construction of three separate components: dock access bridge, laydown yard, and a rail spur connection. The Project has strong support from local communities, local and state agencies, elected local and state officials, and private business. It meets all of the Selection Criteria. The key aspects of the Project are: (1) efficient intermodal access—vessel to truck to staging—between a designated marine highway and the only public facility within the largest tonnage port, (2) construction on a public owned site and right of way, and (3) current and future employment and economic vitality of the region over the Project’s 30 year life span. Key benefits of the Project include: (1) creation of 387 job years in immediate construction, (2) a BCA ratio of 2.6 and $43.2 million in net benefits utilizing a discount rate of 7%, and (3) reduced emissions, reduced truck operating costs, reduced highway and bridge maintenance costs, and reduced safety costs. As America's largest tonnage Port district, the Port of South Louisiana is the premier sea gateway for U.S. export and import traffic... Governed by a board of seven Commissioners, the Port of South Louisiana, which stretches 54 miles along the Mississippi River, is the largest tonnage port district in the western hemisphere.